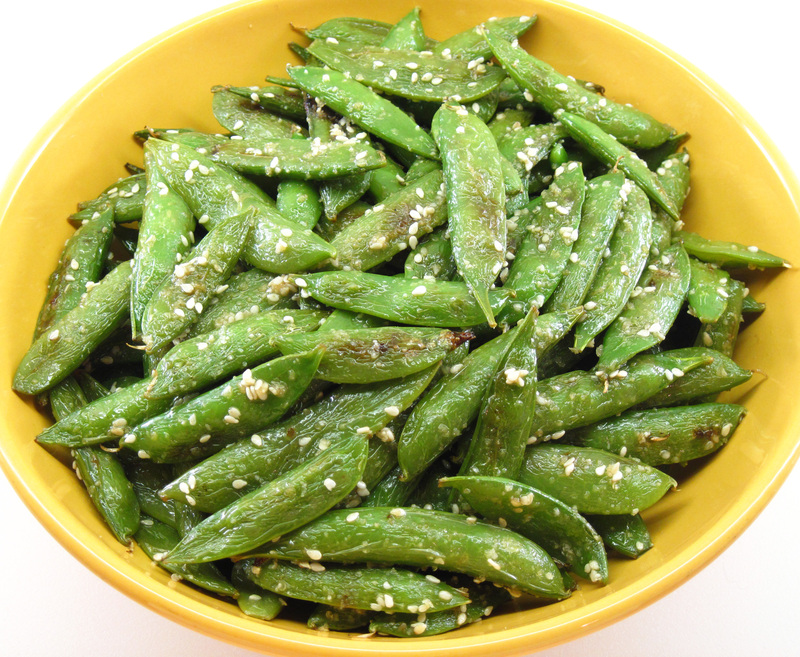 Quick-Roasted Sugar Snap Peas with Toasted Sesame Salt is easy to make and can be served at room temperature, making it a great recipe for entertaining. It’s another winner from Molly Stevens’ wonderful book, All About Roasting. 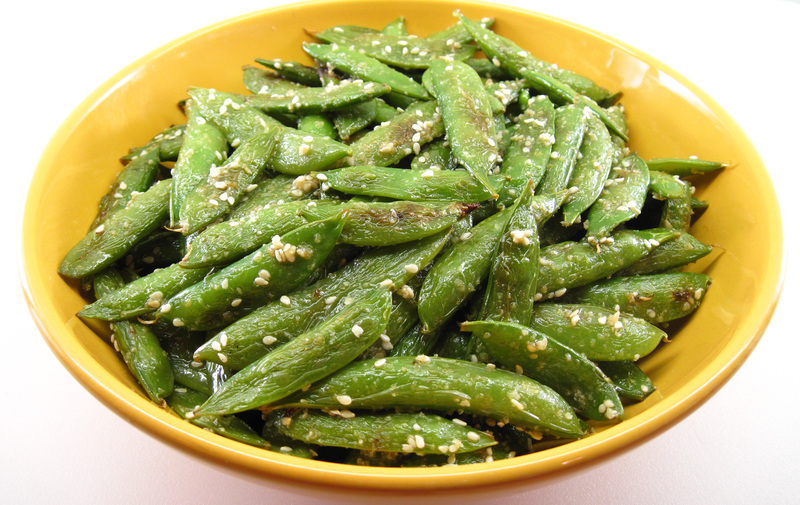 The roasted sugar snap peas are tossed with the toasted sesame salt, which is actually a Japanese seasoning called gomasio. You can buy gomasio in Asian markets or well-stocked grocery stores, but it’s easy enough to make your own. I doubled the recipe to serve eight, but I roasted the sugar snap peas in two batches so they weren’t too crowded. I really liked the Quick-Roasted Sugar Snap Peas with Toasted Sesame Salt and I’m happy to add it to my arsenal of make-ahead vegetable side dishes. Doubles easily, but use 2 large baking sheets so the sugar snap peas aren’t too crowded. I used Mann’s Stringless Sugar Snap Peas. If yours have strings, you’ll need to remove them first. 1. Preheat the oven to 475˚. 2. 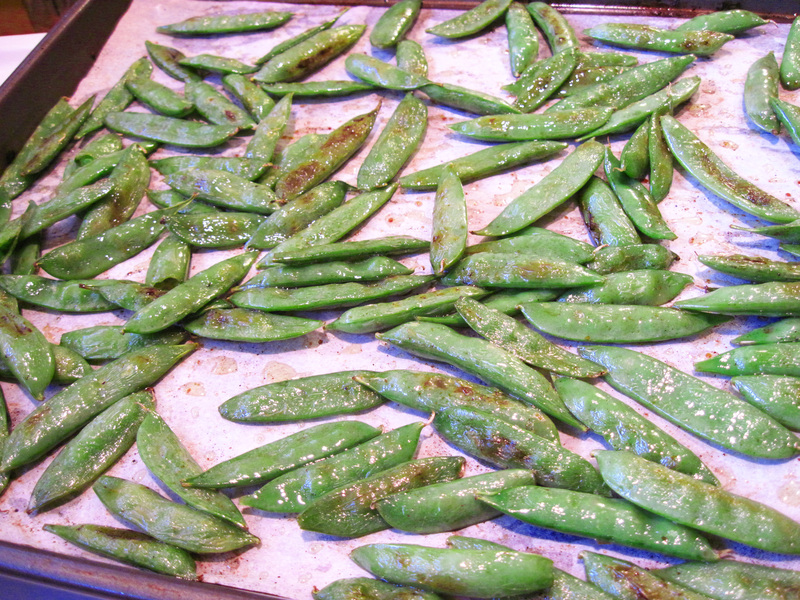 Spread the sugar snap peas out on a large rimmed baking sheet, lined with parchment paper if you wish. 3. Drizzle the olive oil over the peas and toss them so they are well-coated. Spread the peas out so they are in a single layer. 4. Roast the peas for about 12 minutes, stirring them once or twice, until they are done with a few browned spots. 5. While the peas are roasting, make the toasted sesame salt. Toast the sesame seeds in a dry skillet, stirring constantly, for a minute or two. They are done when they have become fragrant and are just starting to deepen a bit in color. Immediately put them on a plate to cool. 6. Grind the sesame seeds with the salt in a mortar or a spice grinder. You can partially grind them so there are still some whole sesame seeds. 7. When the peas are roasted, toss them with the toasted sesame salt. Serve hot, warm, or at room temperature. Hi Kath, Hope you and the family had a great Easter. I love snap peas, looking forward to seeing them in our market. I will try these for sure. I wish we had an Asian market closer, when I do go I’m gonna stock up. Hope you are off to a great start this week. What a simple yet elegant dish! This would be great for spring/summer entertaining. So easy to throw together and a crowd-pleaser too! Thank you for sharing! I’m glad to be back home after a week of traveling…and finally catching up on my favorite blogs. I hope you have a blessed week!